Recently I decided to host my personal portfolio site using GitHub pages. Even though they have very detailed instruction on how to setup custom domain, I found it cumbersome to get to the right information. 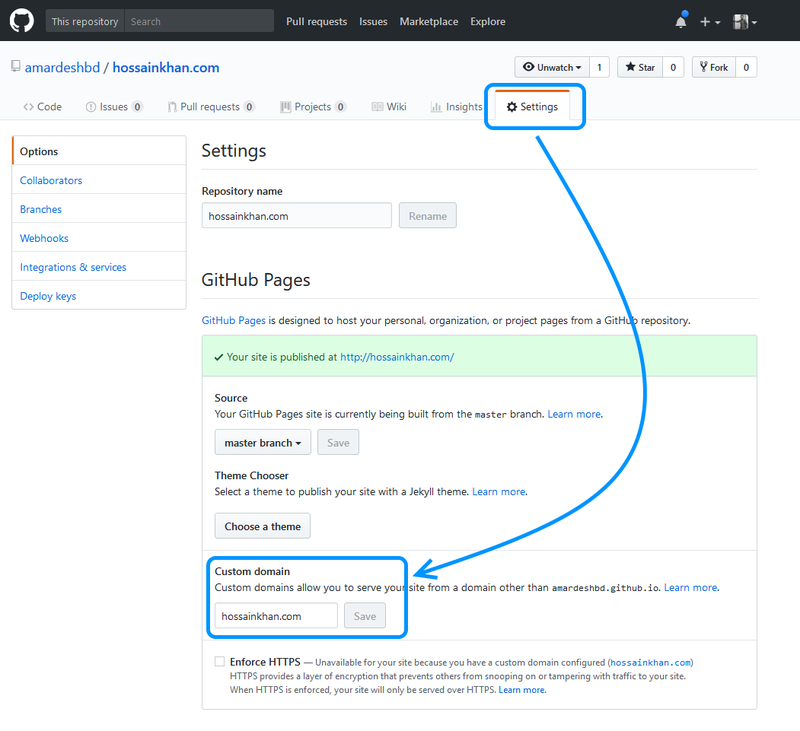 Here are some of the key steps to setup your GitHub pages enabled project to use custom domain. Go to your GitHub Pages site’s repository settings. Under “Custom domain”, add or remove your custom domain and click “Save”. Setting “custom domain” creates a file named CNAME in the same repository. Don’t delete it. This step is specific to your domain name register (like GoDaddy). All you need to do is set A & CNAME records for the selected domain. This is a sample screenshot taken from Google Domains portal. For A record, set 185.199.108.153, 185.199.109.153, 185.199.110.153 and 185.199.111.153. To redirect www subdomain to original domain add a CNAME record with your GitHub pages profile URL with a . (dot) in the end, for example, ‘YOUR-GITHUB-USERNAME.github.io.’. Reference: For most up to date IP Address, use GitHub’s official documentation and for setting up CNAME use this documentation. That’s it, both www.your-domain.com and your-domain.com will go to your selected GitHub pages site. If you want to see a live example, you may visit my portfolio “hossainkhan.com” hosted via GitHub pages ✌️. UPDATE #1: The IP addresses for DNS A record is updated. The new IP addresses are required to use the free HTTPS support for GitHub pages.